A must-have in today’s medical device industry. Every day, millions of people around the world depend on Abbott’s products to help keep them healthy. In today’s highly connected and technologically advanced world, this often means providing critical information—sometimes in real-time—to help people and their doctors better manage chronic conditions. With this innovation in connectivity comes an increased focus on cybersecurity—and the need for experts to work together to tackle the importance of cybersecurity in the medical device industry. “No matter how technologically advanced we become, patients come first. 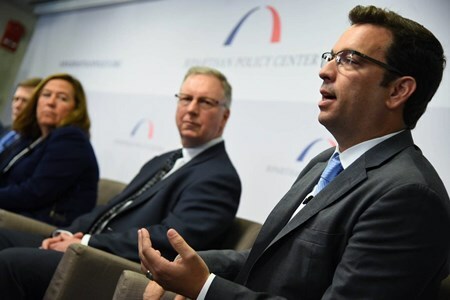 And because of that, we’re focused not only on innovation, but also on continuous improvement.” said Robert Ford, Abbott’s Executive Vice President of Medical Devices, during a forum to discuss the importance of medical device cybersecurity and the role that manufacturers should play in addressing this critical challenge. He also expressed the need for medical device manufacturers to remain proactive, vigilant, and efficient in addressing potential cybersecurity risks. The forum was held at the offices of the D.C.-based Bipartisan Policy Center and included Ford; Michael Chertoff, former Secretary of the Department of Homeland Security; Michael Morell, former Acting and Deputy Director of the Central Intelligence Agency; Dr. Leslie Saxon, Chief of USC’s Division of Cardiovascular Medicine; and William Murray, President and CEO of the Medical Device Innovation Consortium. Abbott's Robert Ford speaks about cybersecurity in the medical device industry. The wide-ranging conversation among these thought leaders underscored the industry-wide nature of medical device cybersecurity risks, while highlighting the immense benefits that these connected devices provide patients and physicians. And we’re encouraging others in this space to be proactive and work together. Abbott recently partnered with Chertoff's security and risk management advisory firm The Chertoff Group to introduce a white paper, titled, “Why Medical Device Manufacturers Must Lead on Cybersecurity in an Increasingly Connected Healthcare System.” The paper talks about the current state of device cybersecurity and proposes potential solutions to begin to address the challenges, like developing standards and more robust information sharing. To watch Ford and his fellow panelists discuss cybersecurity, go to: http://bit.ly/2rHtipI.